China launched Venezuela's second satellite on Saturday, Sept. 29, 2012, delivering a spacecraft to monitor the country's territory, survey crops and natural resources, and aid Venezuela's security services. China launched Venezuela's second satellite on Saturday (Sept. 29), delivering the spacecraft into a 400-mile-high orbit to monitor the country's territory, survey crops and natural resources, and aid Venezuela's security services. 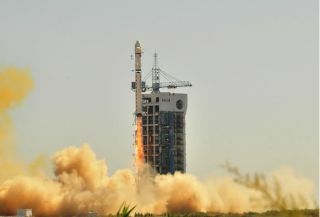 The satellite lifted off from the Jiuquan space center in northwest China at 12:12 a.m. EDT (0412 GMT; 12:12 p.m. Beijing time) atop a Long March 2D rocket. The two-stage launcher deployed the Venezuelan Remote Sensing Satellite, or VRSS 1, into orbit less than 13 minutes later. Tracking data show the spacecraft is orbiting nearly 400 miles (644 kilometers) high with an inclination of 98 degrees. The satellite was built by China Academy of Space Technology, and the launch was arranged by China Great Wall Industry Corp., the state-owned firm responsible for commercial Long March rocket missions. The craft's sensors can resolve objects 8.2 feet (2.5 meters) across. The satellite will return 350 images per day during its five-year mission, according to Jorge Arreaza, Venezuela's minister for science, technology and innovation.